The conflict that the Philippines has experienced for decades has intensified religious, ethnic, and political differences. However, in the Upi municipality – where the population is 60 percent Teduray (an indigenous group), 25 percent Christian and 15 percent Muslim – each group is represented in the region’s government and they resolve disputes in a local council. “The council created is composed of the tri-people,” said Mario Debolgado, Upi Civil Society Council President. Religious and ethnic tolerance is key in peace-building here, and public programs begin with a prayer from each group. Mona Inog, a Muslim resident, said her family has lived in the region for 20 years and that her neighbours look out for each other regardless of their differences. “Our neighbourhood consists of different religions, that household is Christian, while the house right here is a Teduray, and at the back are Muslim households,” Ms Inog said. Teduray resident Mary Jane Timuay agrees. “It is impossible to make bad things against my neighbors because I have seen how good they have been to me, that is why there are no conflicts here,” Ms Timuay said. Tolerance has also ensured income for families in the region, with local market vendors supporting each other. “We are from different tribes here in this market, there are Ilongos, Ilocanos, Muslims, Tedurays,” said Christian market vendor Aurelio Tagaygayatan. “Whenever we run out of products like rice, soft drinks and coffee we get them from their stores. They also get products from us if they run out of them,” said Mr Tagaygayatan. Teduray market vendor Alvin Kulafu is new to the region and opened at the market seven months ago. He admitted he was nervous about divisions between communities. “It was hard for me at first because I do not know the other vendors here and I worried about how to get along with them,” Mr Kulafu said. 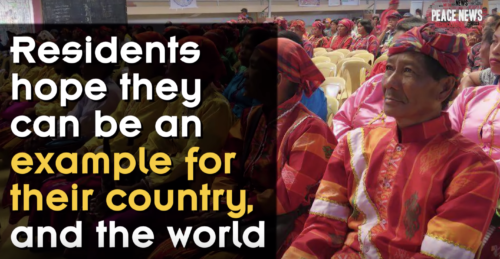 Residents hope they can be an example for their country, and the world.